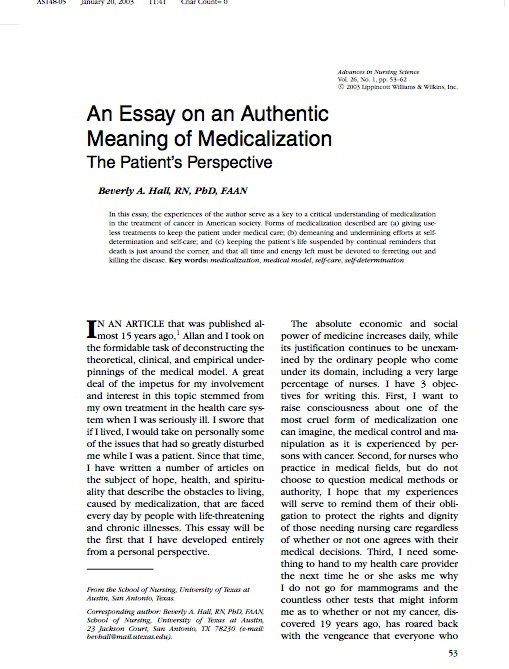 I took a copy of my medicalization article in to my physician 3 years ago when I first hooked up with him and asked him to read it. He not only read it, he said it changed his whole way of relating to patients. He mentioned it again a few weeks ago when I went in to see him. 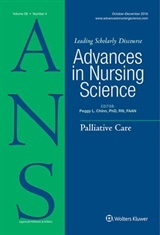 Thanks to Advances for publishing this. Beverly’s work and meeting her made me rethink how people, in our current medical system, often become not people with certain conditions to address, but become and are related to as their diagnosis by the medical community. And often by others. This can be dehumanizing and certainly not empowering. Beverly is one of those rare examples who refused to let this happen and she is now committed to sharing her experience with others and showing them a way to stay true to themselves while dealing powerfully with their illness. This account is one of many examples of the lasting influence of what we publish in the journal. In fact ANS has many articles that are recognized as classic and timely long after the date of publication. I have identified many of these in the “Classics Collection” that appears on the ANS web site. There are a number of other Collections that give a listing of significant articles by topic – articles that were published in the first two decades of the journal and that have retained lasting significance. If you have not yet discovered this treasury of timeless and thought-provoking articles, visit the web site now! When you find something that is important to you, share it with others. We cannot imagine how powerful the ideas that speak to us as individuals might be for others as well!